Previously, on MinerBumping... Agent Alyth Nerun was minding his own business, minding the miners' business in the Alakgur system. After a mad rebel named condoir made a failed attempt on his life, Alyth transferred the kill right and condoir's Mackinaw got nuked. 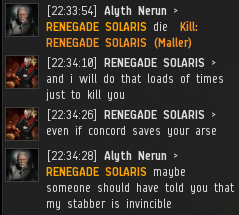 Then rebel RENEGADE SOLARIS made his own failed suicide gank attempt in a Maller. 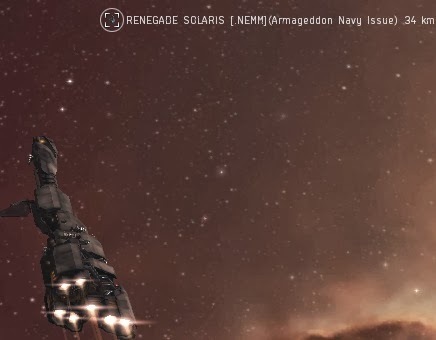 Fifteen minutes after the brutal attack, RENEGADE SOLARIS showed up again, this time in a mighty Armageddon Navy Issue. But this time he was not willing to shoot first. 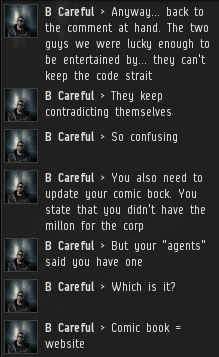 He was counting on me to use the kill right I got from his attempt to murder me, which I had already made available to my corp. 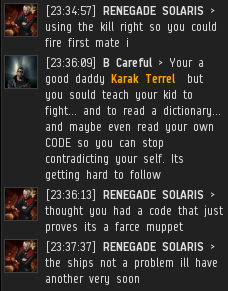 He just placed himself near the belt and watched me bumping his corp buddy. He also tried to show off with his micro jump drive and bragged about the range of his battleship. It was time to bring in Karak on the case. Alyth left the battlefield but not without bookmarking the last location of the Navy Armageddon. Agent Karak Terrel was two jumps out and burned to Alakgur as fast as he could. The race was on! Karak warped to the bookmark Alyth left for him but landed 80km away from the Armageddon. So he started to sneak up on him in plain sight in the hope that RENEGADE would not recognize the Sleipnir as a threat. At 8km Karak scrammed the mighty battleship and started to peel off his shields. No reaction from the battleship. The shields where completely gone when RENEGADE SOLARIS finally returned to his keyboard and started to shoot back. But the mighty battleship had no chance, his big guns could not hit Karak and it went down quickly. He was curious where the New Order headquarters is and whether it was in this station. I tried to educate the man. He went silent after that and the locals where amazed by the acts of justice. They had become eye witnesses to the birth of civilization in their small corner of the galaxy, so they started to praise your name. Alyth's glorious victory left a lasting impression on the rebels and onlookers alike. I was later convo'ed by B Careful, who had a few pointed suggestions to make about my "comic book". Although Alyth/Karak deserves heaps of credit for his quick thinking, courage, and commitment to the Code, we mustn't forget how bad the rebels are. Imagine using an Armageddon Navy Issue to protect an asteroid belt, and then going AFK so an Agent of the New Order can stop by and kill you. That's classic bot-aspirancy, gussied up in a cheap rebel façade. Whether our enemies fit ice harvesters or combat lasers, they're all the same. This isn't something that can be fixed overnight. 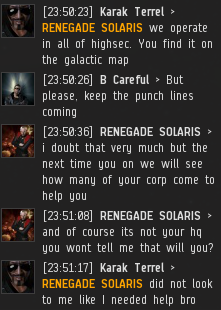 Highsec needs to be rebuilt from the ground up. Do you have what it takes? 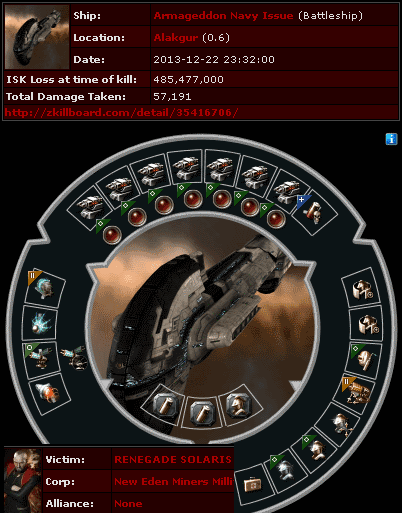 I am Kalorned, and I have what it takes to to rebuild Highsec from the ground up. Great job Agent Alyth! Thank you Kalorned. The great work of you and your team in Gamis is always a great inspiration to me. New Order comic book... that is a stroke of genius! I'd like to see this comic book! 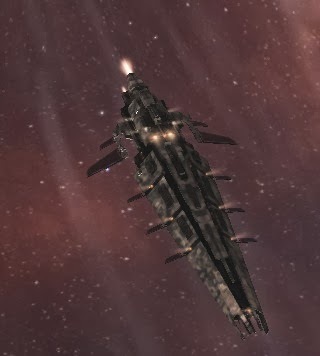 Maybe James 315 will be included in the True Stories of Eve book that CCP announced at fanfest! This system is so full of bots and bot-aspirants that I will have to burn it to the ground before we will be able to build it up. But I'm working on it. Soon we will have a knight in the system and the asteroid belts will be decorated with death barges. Did anybody ever stop to think that the so called compliments could actually simply be sarcastic comments to conclude ones laughter at another? No, but I recommend that you stop to think before commenting.